I live in a small town in South Africa. All kinds of outdoor fun make the “things to do list” in my neck of the woods. 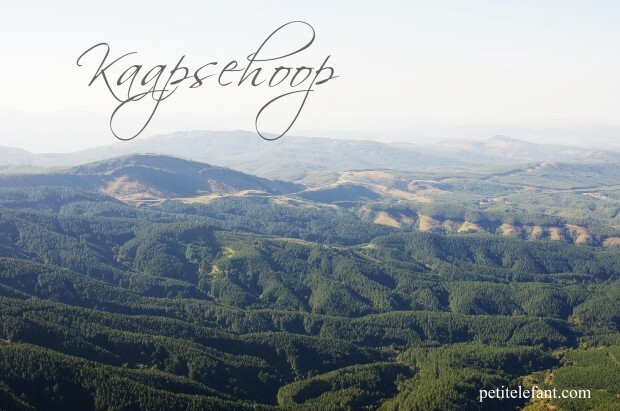 One of my favorite Saturday entertainment options is Kaapsehoop, a mere thirty minute drive from Nelspruit in the Mpumulanga province. You can cruise through the whole town in about sixty seconds, but you can easily spend a day exploring everything it has to offer. This lovely town is best known for the wild horses that roam freely on its streets. They’re friendly enough to give a little rub on the nose even though their big size can feel a little intimidating. My nine-year-old was terrified at first but warmed up enough to name one of them Mr. Ed. There are a couple of cafés where a prego roll or a pancake can be enjoyed, but it’s also a nice place to pack a picnic lunch to eat on the grass. Antique shops and stores with interesting loot are worth visiting, but my favorite activity is the hike to the spectacular view at the top. 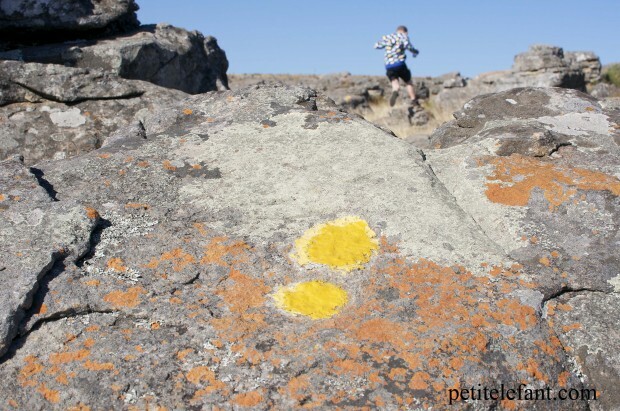 The yellow footprints clearly mark the path that’s simple enough for kids to hike. Depending on your explorers, you can enjoy a roundtrip hike in about thirty minutes or two hours. You’ll want to linger at the top. The view is breathtaking. 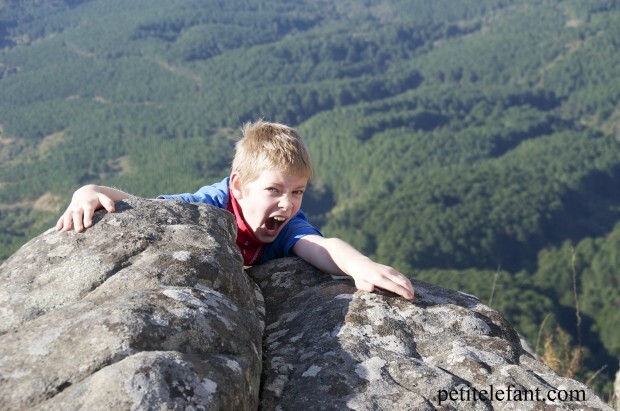 A camera is a must, especially to catch the illusion of hanging off a rock! To be totally honest, I don’t like to exercise. I like the benefits of it, and I value being healthy, but I don’t like taking the time to do it. That’s why I love towns like Kaapsehoop. You get to enjoy some memory making family time while exercising your legs in the great outdoors. Win, win. 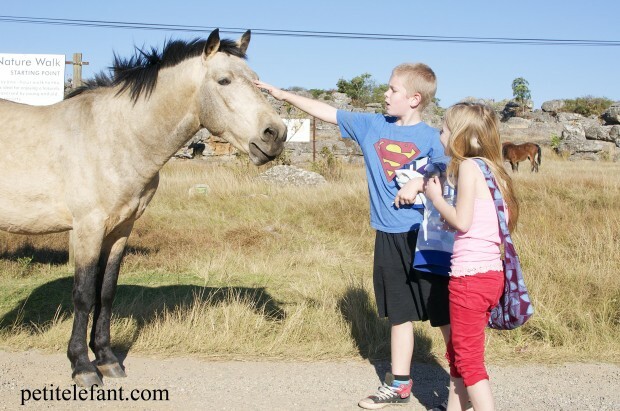 Kruger National Park is always a must if you’re visiting the Mpumulanga region, but if you find yourself longing for a simple adventure in a quiet town filled with wild horses, then Kaapsehoop is your place. It’s ah-mazing. In case you missed it, here is some more South Africa awesomeness. So, tell me…am I alone in this exercise thing? What kinds of things do you do as a family to promote health and exercise?